Like any other 20-year-old, Nicole Freitag is always on the go. “I can’t remember the last time I actually had free time during the day,” she said, laughing at the sad reality. Every morning, Nicole wakes up at 6 a.m. to workout; after her workout, she showers and gets to school by 8, where she goes to class until 4 p.m. After class, she heads over to work, where she mans the cashier at a fast food burger joint until 9 p.m. Finally, she heads home to do homework and spend time with her puppy. 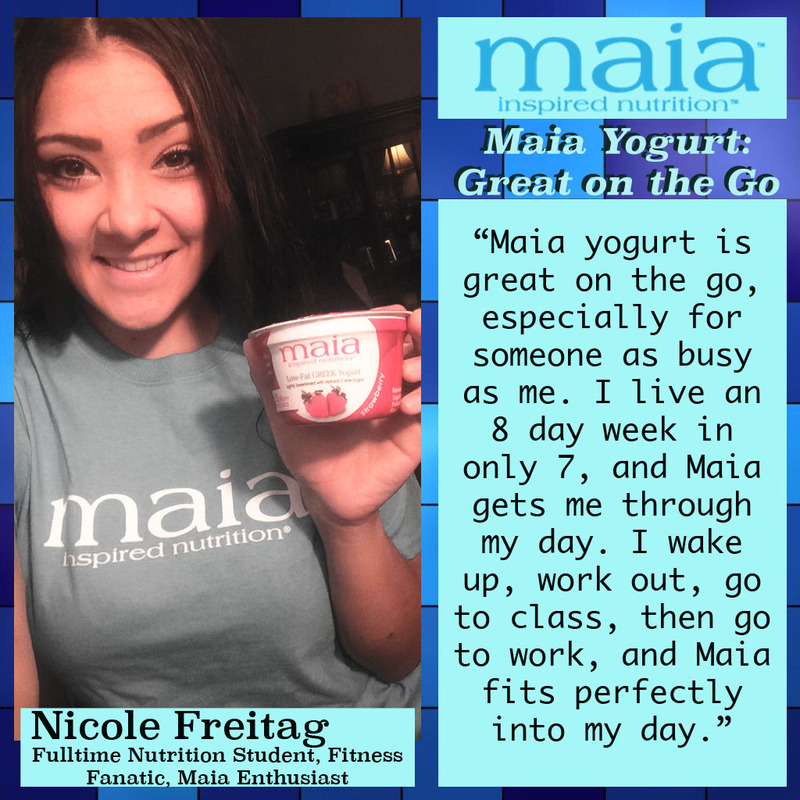 One would assume it’d be difficult for someone as busy as Nicole to stay healthy, but that’s not the case; she’s hell-bent on keeping a healthy lifestyle, and that’s where Maia Yogurt comes into play. Maia is the perfect snack for someone constantly on the go and eliminates the excuse ‘I’m too busy to eat healthy.’ This gluten free yogurt comes in the perfect portion size, and each cup is packed with more than 25 billion probiotics. Nicole is dedicated to a healthy lifestyle. After putting on some weight after her first semester freshman year, she evaluated how she was eating, and decided to make a change. In the past two years, Nicole has lost over 30 pounds, and it’s all thanks to her hard work and her dedication to eating natural foods like Maia. “I try to eat as naturally as I can,” she said. Follow Nicole’s fitness journey on Instagram at @nicolefreitagfitness for workouts, recipes and the motivation you need to get going—and don’t forget to grab a Maia Yogurt while you’re doing it (Nicole’s recommends the strawberry flavor).